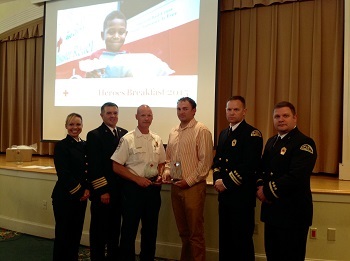 Two members of Hall County Fire Services were recognized Wednesday morning during the American Red Cross Northeast Georgia Chapter’s Heroes Breakfast. The annual event recognizes and honors those in the community who have shown courage, dedication and character through extraordinary acts of heroism and kindness. Hall County Firefighter Colton Stroud was recognized with the Emergency Response Hero Award for his lifesaving efforts during a jet-ski accident while off duty. Meanwhile, Hall County Fire Lt. Chuck Jarrard was presented with the Community Hero Award for his quick response to a training incident last year. The American Red Cross Northeast Georgia Chapter joins service areas nationwide in the signature event that recognizes and honors those who have performed heroic acts to help others in need.